I've had a quick look﻿ at what the video camera has captured over the last few days. The good news is that we do seem to have a pair who are very keen to breed. However, the really interesting thing is that the female is NOT Alice. As you can just about see, she has no rings on either leg. There is a video of the new female here. There are no eggs yet. We have a nesting pair! This morning both CR and DX were ﻿seen on the Abbey tower, and what's more, Alice was sitting in the nesting tray! This explains CR's scraping behaviour over the last week or so. Christopher Robin was higher up the tower. 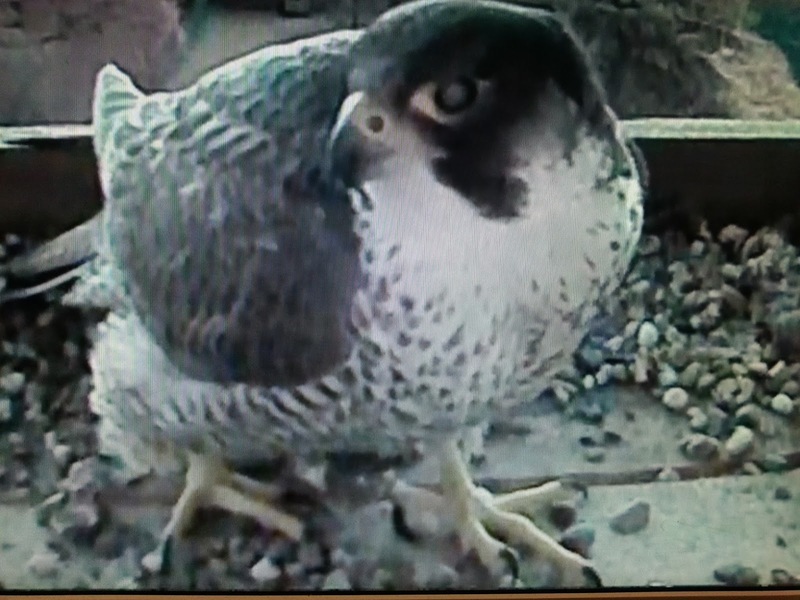 I will check to see what the video camera has captured later in the week to see if she might be sitting on any eggs yet. The camera has spotted Christopher Robin making a scrape again. He is instinctively behaving like there is a nest with eggs, and could be a good sign if Alice reappears, however she has not been seen for several weeks. The video camera has caught Christopher Robin again. Sadly, there is no sign of Alice, so why was he doing this? Sadly, there is still no sign of Alice, although Christopher Robin is still around. The video recorder has not captured CR since 1st April, bit it has recorded lots and lots and lots of pigeons, and a pied wagtail. Unfortunately, Alice hasn't been seen since the video of 17th March, not even at Bishop's Cleeve. Fingers crossed she will turn up somewhere soon. Christopher Robin is still around. I saw him this morning flying from his usual perch on the east side of the Abbey tower. There is much better news from Christchurch Cheltenham where CR's mum and dad have produced another batch of 4 eggs. Click HERE to see Dave Pearce's video of the last egg being laid. Alice - where are you? Everybody was really excited after the last post to this blog, however since then nothing has been seen of Alice, neither at Tewkesbury or Bishop's Cleeve. Christopher Robin is still around - this short video was captured yesterday. If you study the video from 17th March carefully, you will see that Alice has a damaged foot with one talon on her right foot at the wrong angle. Let's hope that this hasn't caused her any problems in feeding herself. 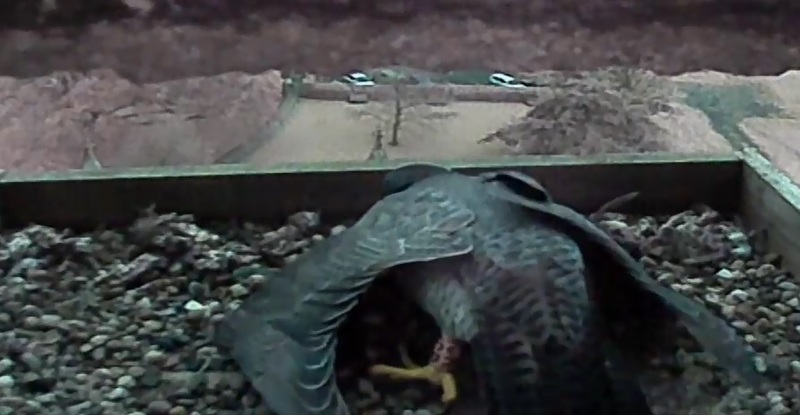 There's much better news from Christchurch Cheltenham, where the female has laid her first egg!